It was “the most energetic and firm response to those who, from the centers of power in the United States and the European Union, backed by tiny mercenary groups, try to discredit us with false slanders,” said Salvador Valdes Mesa, secretary-general of the nearly 3 million-strong Cuban Workers Confederation. 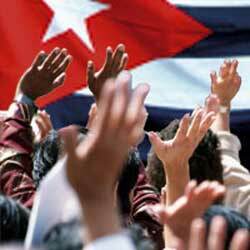 Some marchers sang, others waved cardboard signs declaring “We are the people of Fidel and Raul” or decrying the United States. A few screamed “Long Live Fidel!” until they lost their voices. Wearing a straw hat and white dress shirt, President Raul Castro grinned and waved from a high wooden podium as marchers streamed past.His older brother Fidel has not been seen in public since undergoing emergency intestinal surgery nearly four years ago and it was no surprise he didn’t show, though organizers used loudspeakers to blast past recordings of his voice. He also failed to issue a written statement in the pre-dawn hours before this year’s march, as he had done the three previous May Days. [. . .]The march was over in barely two hours, far less time than it used to take Fidel Castro to get through one of his May Day speeches of years past. This time only Valdes spoke, urging Cubans to be more productive despite average state salaries worth only about $20 per month. He struck a somber tone, warning that Cuba would have to “confront realities” economically that could make life even tougher for many who are already grindingly poor.